When we first meet Rey in The Force Awakens, she’s collecting scraps and parts to sell. We see that her dangerous work only amounts to less than a full portion of food (1/4th of a full meal to be exact). She lives alone, eats alone, and communicates with no one outside of the junk dealer. This is presented to be her daily routine, and presumably has been for roughly 15 years. A life of barely having enough to survive and constantly having to work harder than the day before to even have the option of surviving just to repeat the same hopeless cycle. That simple lie is what made Rey get up every morning and go through hell just to live one more day. As long as she believed her situation wasn’t permanent and that there was in fact an end goal, she had hope. The hope that she would be rescued by her parents one day and that they’d explain why they left her in the middle of nowhere to suffer without them. One day they will be back to embrace her and tell her how much they love and missed her. One day they’d take her far away from Jakku on an adventure of her own to make every hardship she faced all worth it. If that day wasn’t today, then it must be tomorrow. However, there was a tragic side to that hope. Rey became so convinced that her lie was reality that she was determined to live in it no matter what. Her decision to stay on Jakku even though she was a capable pilot as well as her decision to attempt to flee back to Jakku in a panic after Maz Kanata tells her that the Skywalker saber calls to her and that her destiny lies in her future not her past are both made out of fear. 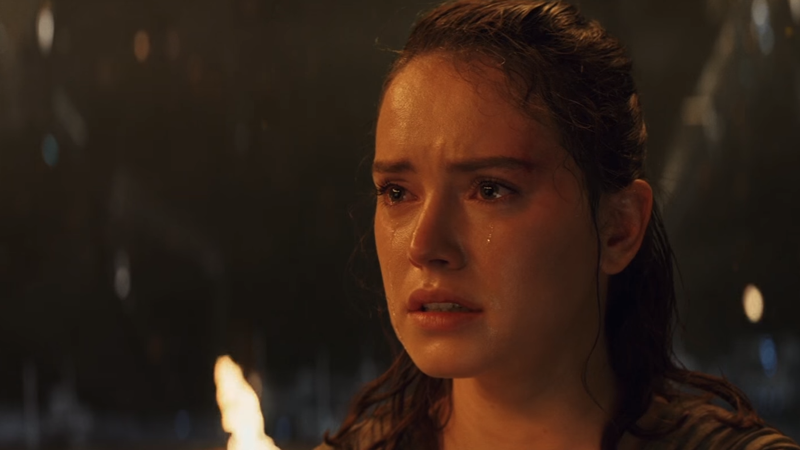 Rey fears that if she ever admitted to herself that she was truly left to die by the very people that gave her life, as if she were nothing in exchange for coin, then that would strip her of her will to keep surviving. Without the promise of her parents, Rey feels that she is nothing, with no reason to even exist. So she decided to stay on that desert planet and was determined to remain because eventually it would all have to be worth it. Eventually her parents would come back, even if it took them her entire life to get around to it. The reason why I think this all builds her character is because of how it relates to both older and newer fans of this franchise. Many of us are the first in our families. The first graduates of college, the first doctors, the first lawyers, the first successful entertainers, the first mechanics, the first plumbers and so on. And for a child who has no role model to look to in order to drive them towards their goal, it can be hard to accept anything but the lie you tell yourself in order to not experience crushing disappointment. That you can’t be the first, your family history can’t change, and it’s better to be good at being mediocre than to make an attempt at greatness and fall farther than where you started. Rey used to be that person, she used to accept her mediocrity because it was the path of least resistance. As long as she believed her parents would return, she was perfectly content with finding scraps in order to receive scraps of food. As long as she believed that lie, she couldn’t fail. She, like some of us, may dislike that path but feel it’s better than trying to be anything else. The Last Jedi told us through Rey that the first step towards greatness is to break free of your lie. No, your parents weren’t Jedi, or doctors, or musicians but that doesn’t mean that you can’t be. These are just your first steps. Whether you choose to accept this as truth and be greater than your roots or continue to be comfortable in a convenient lie that allows you to simply continue existing is the choice that Rey, and by proxy the audience, is tasked with making. While some more vocal fans have decried this as her being an unrealistic “Mary Sue,” I believe that this revelation makes her more like us…maybe even more so than, much like Rey, we’d like to admit to ourselves.